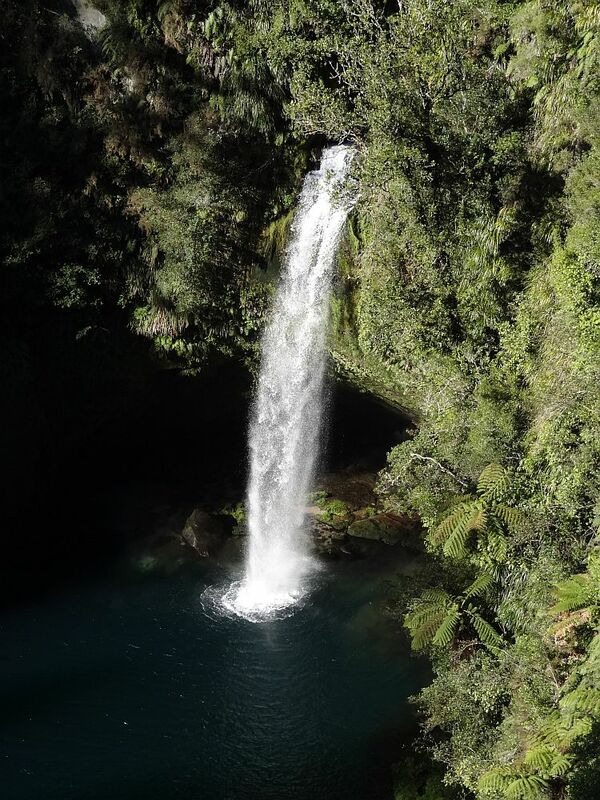 Omanawa Falls and the plunge pool below it can be seen from a viewing area above the falls, about 15 minutes easy walk from Omanawa Rd. 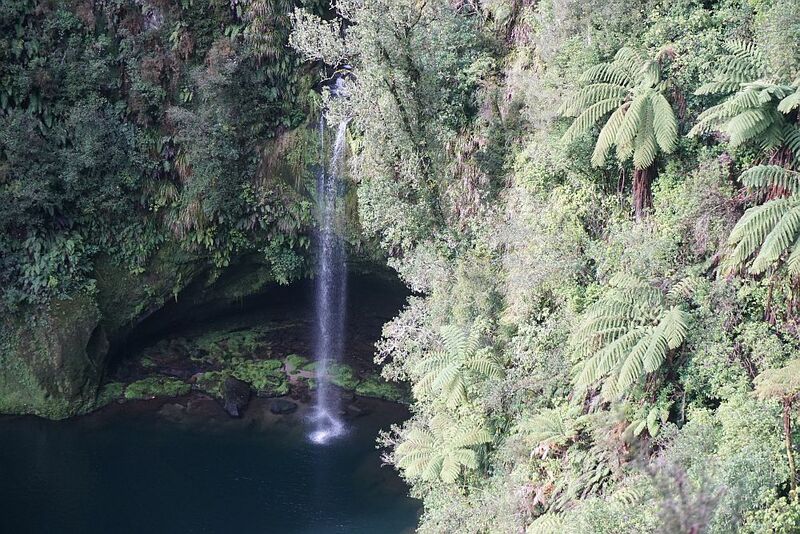 The falls are about 20km by road south-west of Tauranga. There is a small parking area by the road, but no facilities or information except for a small sign pointing to the access track. 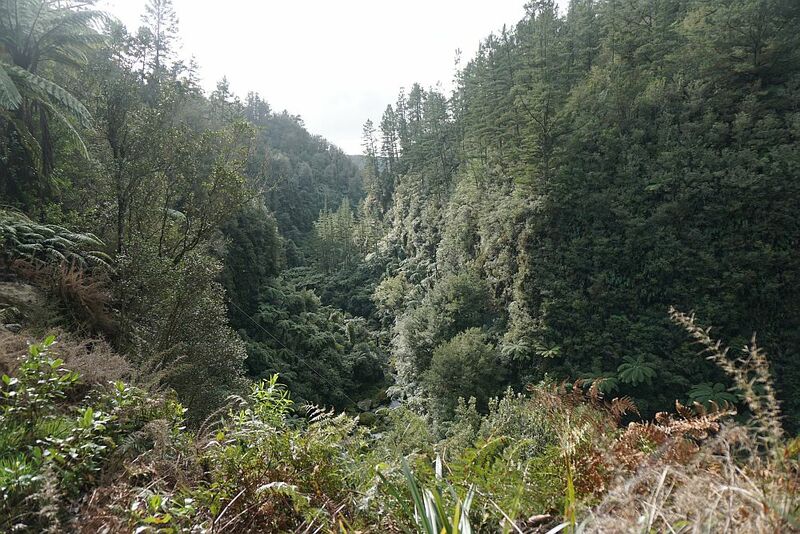 The Omanawa River plunges about 35m in a single fall. The water from the river is partially diverted through the Omanawa Falls Power Station, the first underground power station to be built in the Southern Hemisphere. The original power station was built in about 1915, and rebuilt and restarted in 2008 after being closed for some years. Unfortunately with the power station running again there is less water in the waterfall, being reduced to almost a trickle despite ample recent rainfall. 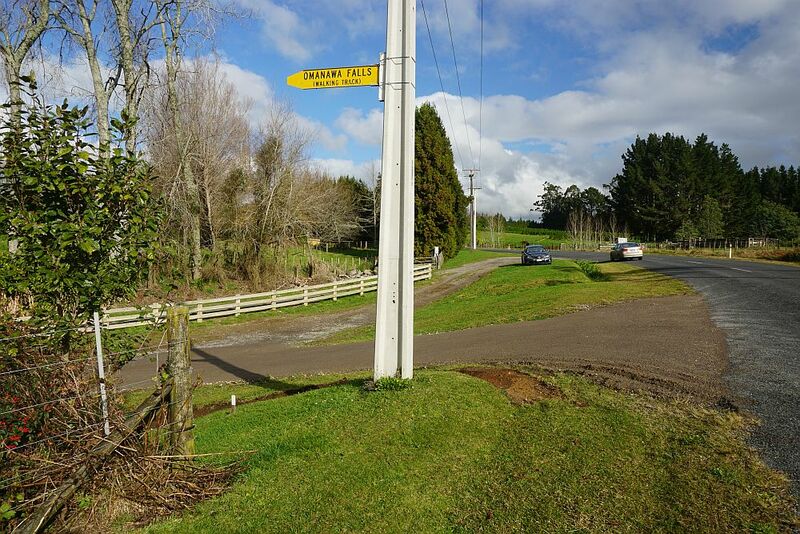 The parking area by Omanawa Rd, with the only signage indicating the route to the waterfall. The track has recently been upgraded with improved drainage, presumably to ease access for equipment and supplies to the power station. 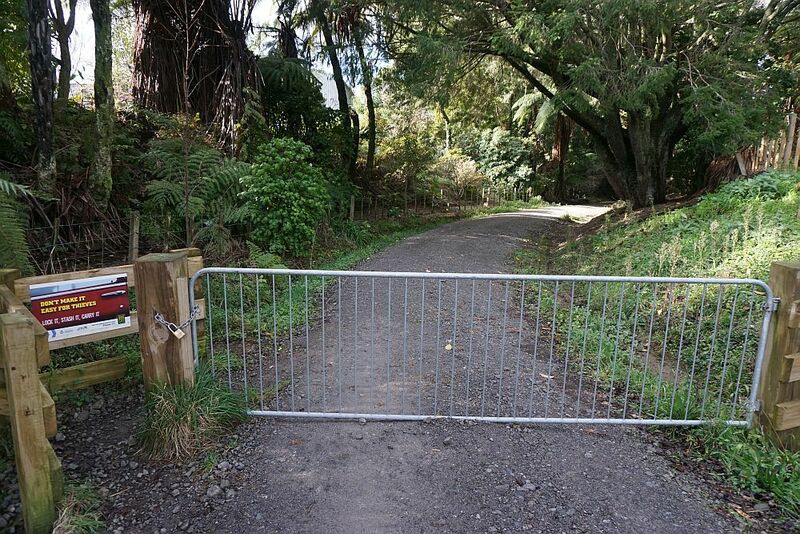 The gate is normally locked. 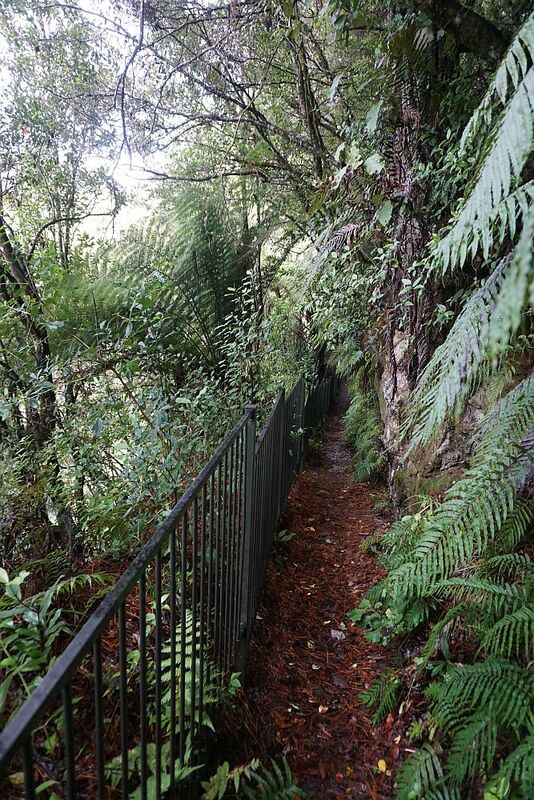 The walk from the road is all downhill on a tree-lined track. 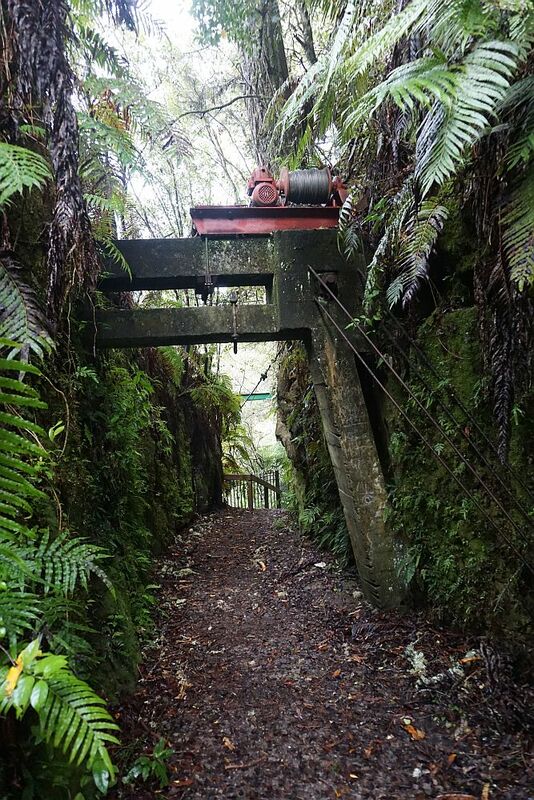 At the end of the vehicle track there is a cable and winch on a solid frame, used to transport equipment and supplies to and from the power station about 60m or more lower down. 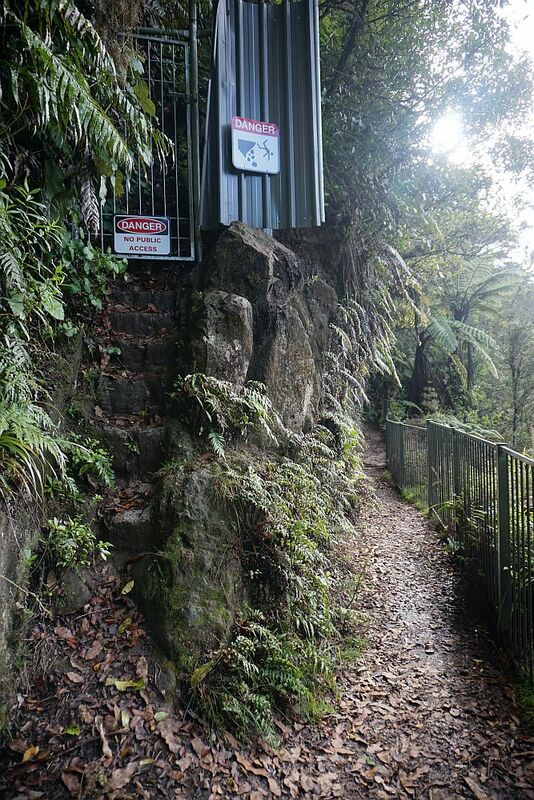 From the winch head there is a narrow track with railings, hewn from the hillside, to the falls lookout. The track ends with steps down to a locked steel door, used for closing off access to the power station. With most of the river being diverted through the power station the falls are reduced to a trickle. Water exits from the power station causing the ripples in the water at the lower edge of the photo. The same falls during a visit in July 2013. Apparently the power station was not in use on that day. 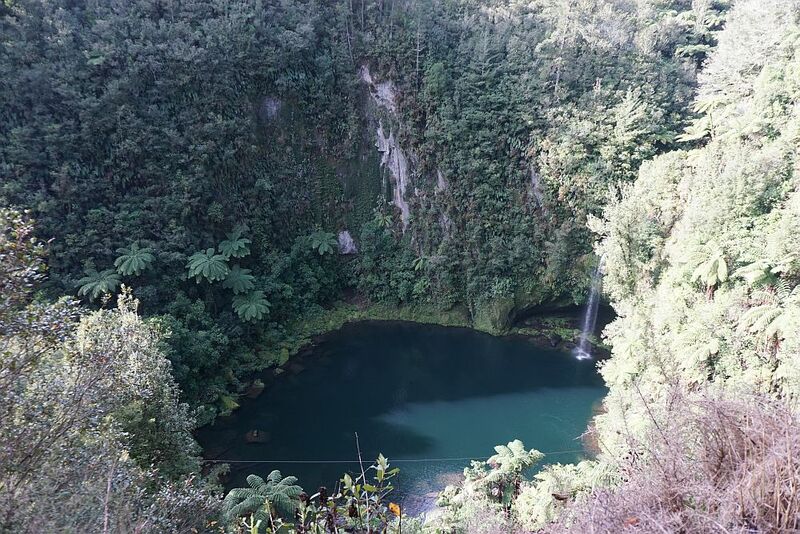 The pool below the falls is surrounded by steep cliffs on 3 sides., There is no public access to the pool below the falls, although in summer people can often be seen swimming in the pool. The cable leading to the power station can be seen crossing the lower part of the pool. The unofficial access to the pool is closed off, being steep and dangerous, with occasional helicopter rescues required when people slip and fall. Looking down the valley below the falls, from the falls viewing area. The transport cable can also be seen crossing the valley. 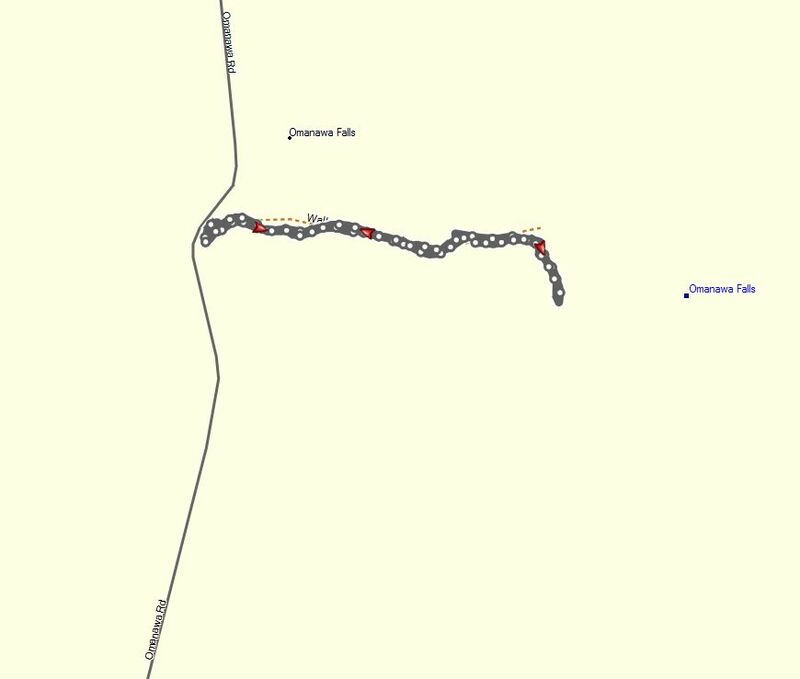 The GPS tracklog shows the route to the lookout. Total distance return about 1.5km, total time about 30 minutes. The short track was walked on the shortest day, June 21, 2015, and on several previous occasions. Photo with larger water flow from walk on July 16, 2013. 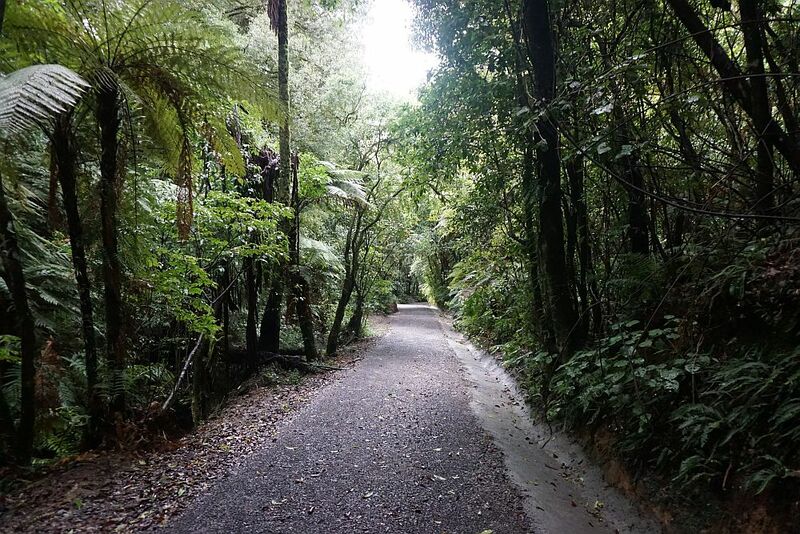 This entry was posted in Walks and tagged Omanawa Falls, Tauranga on 2015-06-22 by nzartig.